As part of outreach and education, ArtsVote asks mayoral and councillor candidates – incumbents and challengers alike – “What do you ArtsVote For?” Based on public record (voting track record over the last four years for incumbents, plus profile research on the challengers) and responses to surveys delivered to all candidates (with contact info listed with the City), as well as a Mayoral debate, ArtsVote prepares its Election Report Card. 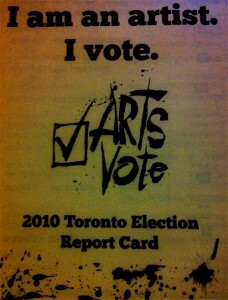 In 2010’s municipal election, ArtsVote predicted two thirds of successful councillor candidates running in a ward where there was no incumbent! Congratulations James Pasternack, Anna Bailao, Mike Layton, Josh Matlow, Kristyn Wong-Tam, and Mary Fragedakis. How will Toronto’s future municipal leaders contribute to these issues? Pick a Winner – vote for those candidates who will be most supportive. How will you ArtsVote?